A change in the jet stream pattern this week will not only break the south from the constant, flooding rainfall, but it will also give much of the upper Midwest a break from the rain as well. 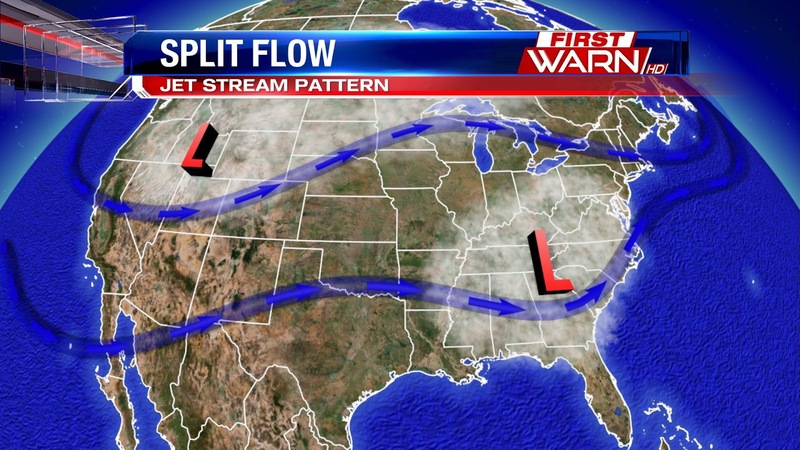 Winds in the jet stream will remain split, meaning one branch of the jet stream will shift north while the southern branch of the jet stream remains south. This puts Northern Illinois and Southern Wisconsin right in the middle. Temperatures will slowly warm each day, but it looks like we're going to begin the first day of Meteorological Summer slightly below average. High temperatures will only warm to the middle and upper 60's. The average high for the first of June should be around 77 degrees. This type of pattern will also keep us fairly dry through much of the week. Rain will be possible late Thursday night and into Friday, but at this moment the upcoming weekend only features an isolated shower/storm threat. 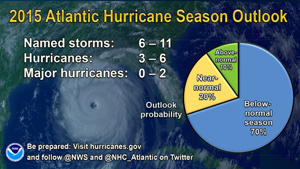 Scientists at NOAA's Climate Prediction Center say that the 2015 Atlantic hurricane season will likely be below normal. However, that doesn't mean that the coastal areas are off the hook, because it only takes one. The hurricane season officially runs from June 1st through November 30th, and NOAA is predicting a 70 percent likelihood of 6 to 11 named storms; which have winds of 39mph or higher. And, 3 to 6 of those could become hurricanes, which have winds of 74 mph or higher. Anywhere from zero to 2 major hurricanes, which are category 3, 4, or 5; with winds of 111mph or higher. While a below normal season is likely, there is still a 20% chance for a near- normal season, and a 10 percent chance of an above normal season. Even if a below-normal season occurs, it only take one hurricane to produce catastrophic impacts communities. This week, May 24-30, is National Hurricane Preparedness Week. To help those living in hurricane-prone areas prepare, NOAA offers hurricane preparedness tips, along with video and audio public service announcements at www.hurricanes.gov/prepare. "It only takes one hurricane or tropical storm making landfall in your community to significantly disrupt your life,” said FEMA Deputy Administrator Joseph Nimmich. “Everyone should take action now to prepare themselves and their families for hurricanes and powerful storms. Develop a family communications plan, build an emergency supply kit for your home, and take time to learn evacuation routes for your area. Knowing what to do ahead of time can literally save your life and help you bounce back stronger and faster should disaster strike in your area." "NOAA will issue an updated outlook for the Atlantic hurricane season in early August, just prior to the historical peak of the season." For the full report you can check it here. 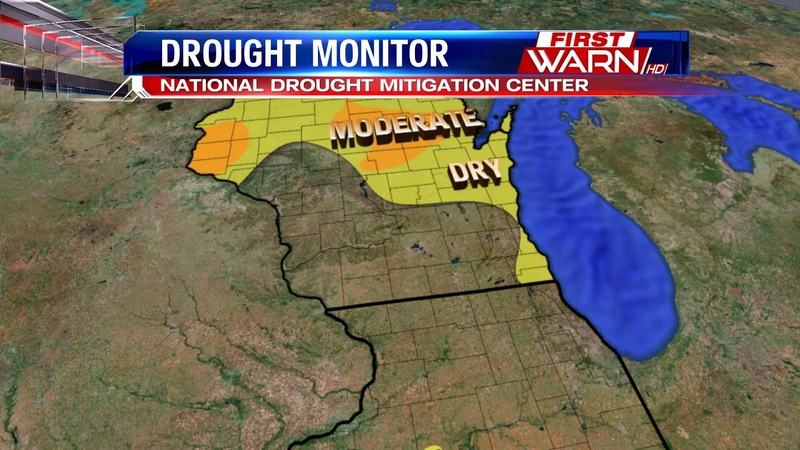 Drought conditions haven't been overly severe in Northern Illinois, but dry conditions were becoming a bit of a problem for some. But, with the heavy rainfall we've had earlier this week, Northern Illinois is no longer considered in the abnormally dry category. Still, drought conditions persist across central and far Southeast Wisconsin with moderate drought conditions in a few counties. More rain is in the forecast for Friday and early Saturday, but after that the skies look dry until late next week - at the earliest. As scattered thunderstorms develop during the afternoon and evening Friday, heavier downpours will be possible. 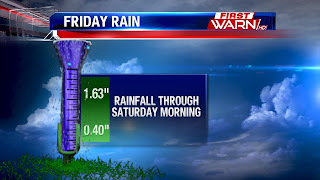 Rainfall amounts up to an inch, or higher, will be possible with any stronger storms. 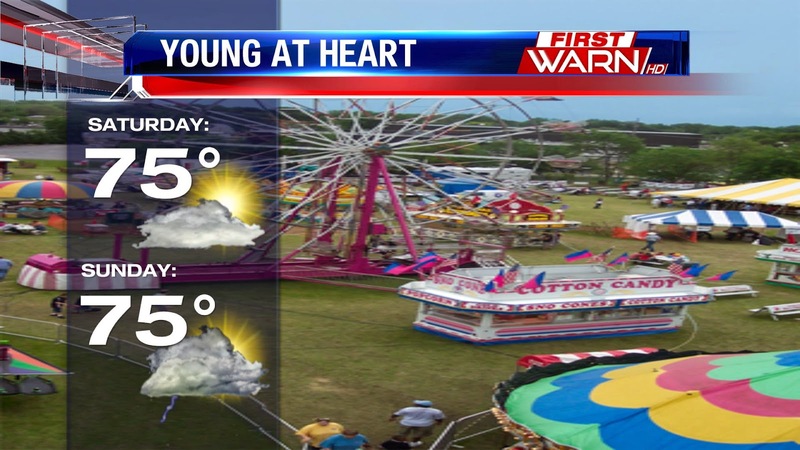 Temperatures Thursday afternoon were warm, but it wasn't overly humid. That will change late Thursday night and Friday afternoon ahead of a cold front that will sweep through by Saturday morning. A weakening area of thunderstorms continues to expand across southern and eastern Iowa Thursday evening. We likely won't see too much of that here until after Midnight, meaning you should be able to make the most out of your Thursday evening. An increasing low level jet will slowly build across Iowa tonight. Just like the main jet stream up above, the low level jet helps focus thunderstorms (especially ones that develop overnight). 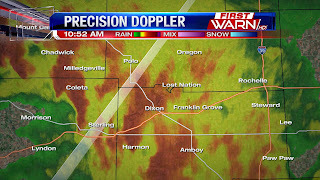 It provides the moisture and wind needed to help keep thunderstorms going. 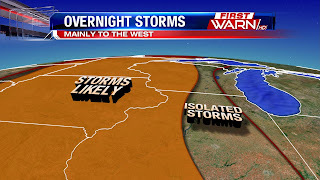 As that begins to veer east Friday, we'll begin to see thunderstorms increase in coverage through the day. A likely scenario that will play out Friday is this: ongoing showers and thunderstorms will be lifting north into Wisconsin during the morning Friday. There could be a time that we begin to clear out mid-morning in the wake of those showers. With the heating of the day, scattered thunderstorms will begin to develop during the afternoon and evening. Now, there isn't a lot of forcing in the atmosphere - meaning not a ton of upper level jet stream support - but there will be a decent amount of moisture. As a cold front slides east through late afternoon and evening, thunderstorms will continue into the overnight. Severe weather remains low, but a few stronger storm cells Friday could have gusty winds. Heavy rain will also become a threat with any storms that do develop, which could lead to minor flooding. As always, if you have any outdoor plans on Friday, make sure you keep an eye to the sky and right here for all the latest updates. 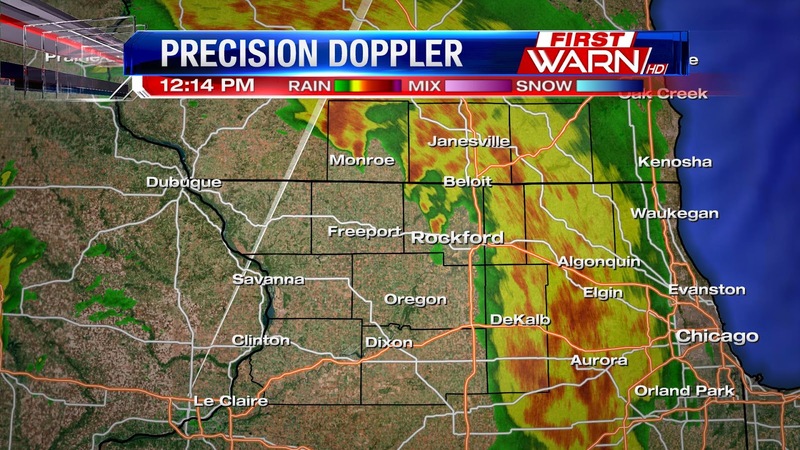 12:30 - Currently the band of rain with embedded storms in now moving to the Northeast of the Rockford. But, we will be watching this area for any redevelopment this afternoon. 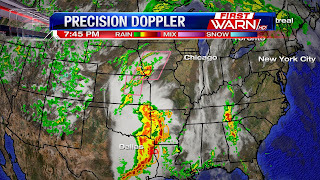 We are currently in the warm sector of this system with a surface low pressure system over Iowa, a stationary warm front in central Wisconsin, and a trailing cold front to the west. The cloud cover we currently have is keeping the severe threat low, but if we can get some clearing in the cloud cover, the severe threat will go up. The biggest concerns will be heavy rain and strong wind gusts, however we can't rule out a brief, isolated tornado. Right now we have a warm moist layer up above that is limiting the severe potential as well. If we get more sunshine this afternoon, this will help to destabilize the atmosphere. That, along with a veering wind profile ( winds moving clockwise with height), is what is giving us the potential for a low end tornado risk. 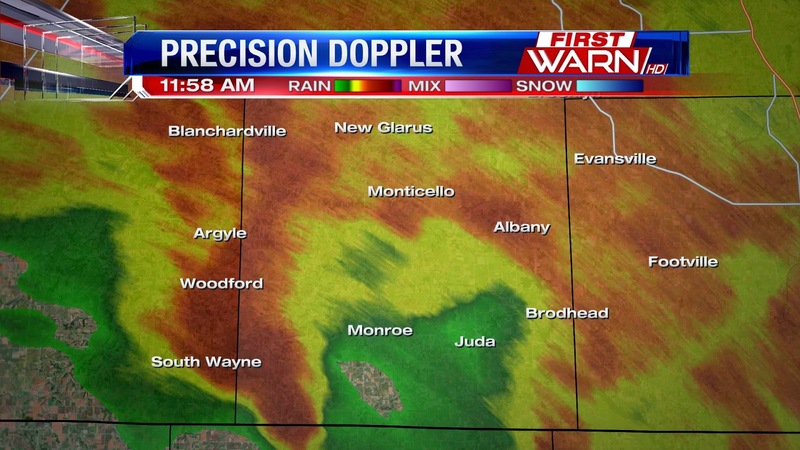 UPDATE: Strong thunderstorm with very heavy rain moving through Monroe. Wind gusts up to 30mph, but localized flooding will be the bigger threat. 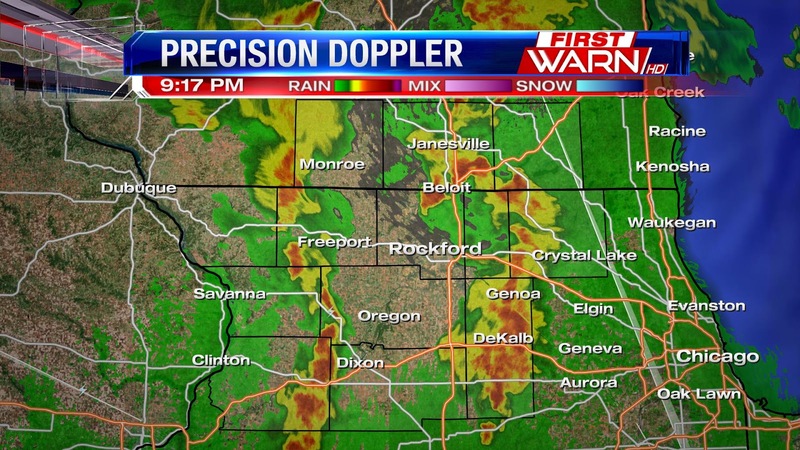 Currently heavy rain with a few embedded thunderstorms have been moving Northeast across the Stateline area. 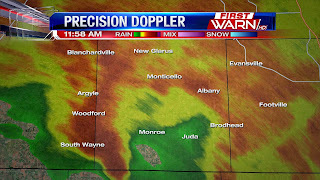 There are currently no watches or warnings in place, and we will continue to monitor these storms and any that develop. 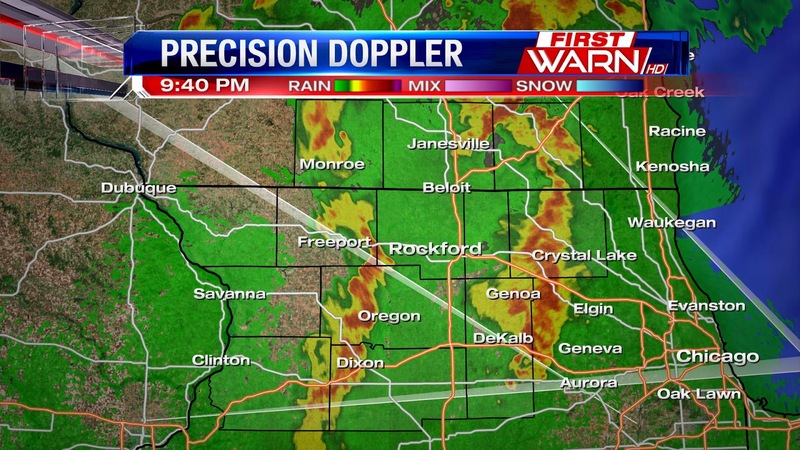 Strong Thunderstorm with wind gusts up to 50mph. Very heavy rain is occurring with this. 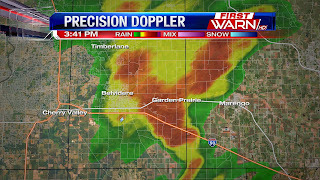 Heads up Amboy, Ashton, & Dixon. This storm is moving to the Northeast at 40mph. Torrential rain is occurring with this storm and could see localized flooding on roadways. Make sure to never drive through a flooded roadway. 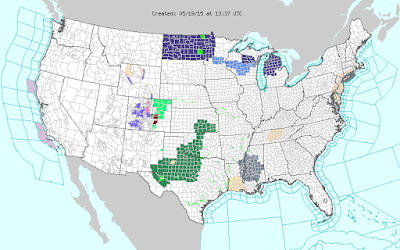 It's been one week after another of nothing but severe weather and flooding rain for Texas and Oklahoma, with many towns breaking their all time record precipitation totals for the month of May. And that was only half way through the month! 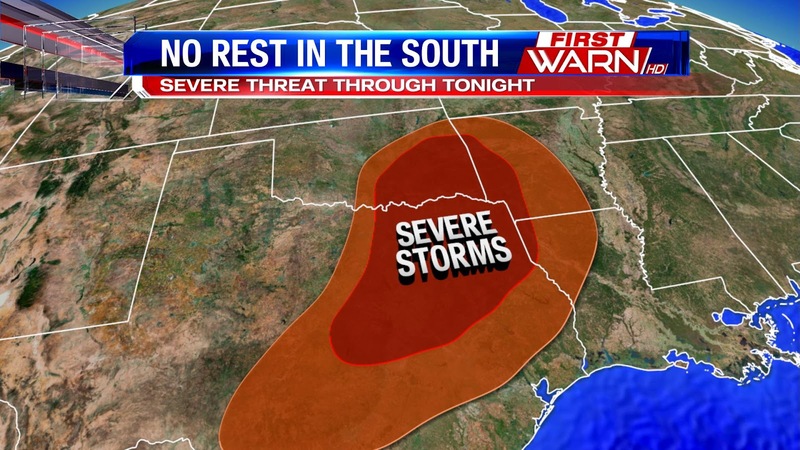 Now, on Memorial Day, severe weather continues for Texas and Oklahoma, but will move into Louisiana and Arkansas over the next several hours. Severe thunderstorms also extend a bit further north into Kansas, Iowa and Missouri where severe thunderstorm watches have been issued. Flood warnings and flash flood warnings have been hoisted for an already saturated ground that can't hold any more rainfall. Flooding has become a big problem in Texas this past week. 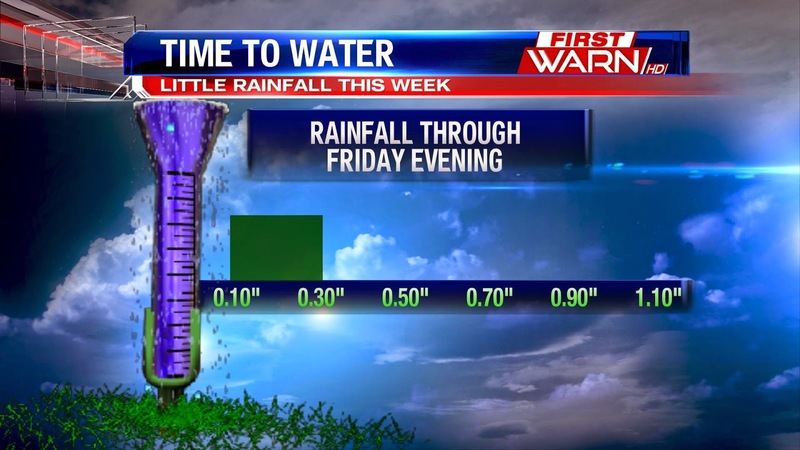 Unfortunately, the pattern through the week continues to point towards daily heavy rain producing thunderstorms. Quiet a bit of heavy rain moved through last night and early this morning. Here's a look at some 24 hour rain fall totals across the Stateline area. Starting to see an uptick in the showers a bit here this morning. However they are still remaining widely scattered as a negatively tilted trough, or area of low pressure, moves through north east Iowa and north western Illinois. 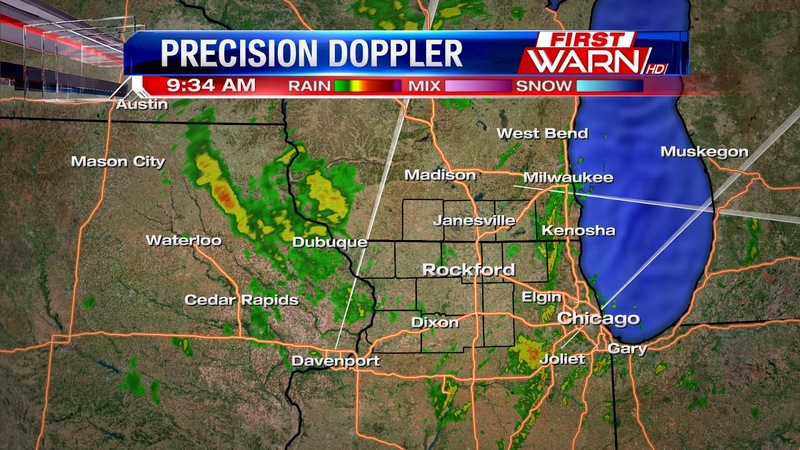 This could bring brief heavy downpours for the next few hours, through about noon or 1pm. After that the area looses a lot of forcing with the warm front that brought the heavy rain overnight now into portions of north central Wisconsin. Skies will continue to clear through this afternoon, becoming partly cloudy to mostly sunny later on. You'll have to deal with gusty winds at times through the afternoon. We could see wind gusts up to 35mph from the southwest through about 4 or 5pm. 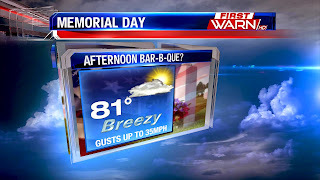 It will feel a lot like summer this afternoon for any outdoor bar-b-ques, temperatures will warm into the low 80's and upper 70's, and with dew points in the 60's it will feel a bit muggy as well. Overall not a bad day to get outside, but if you do have any outdoor picnics or activities keep in mind the gusty winds, and maybe add an extra hotdog or burger to keep your plant from flying away! 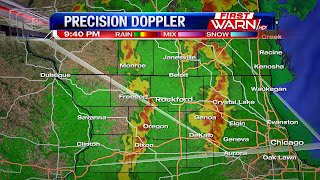 10:25pm Update: The Tornado Watch has just been canceled for Winnebago, Boone, Ogle, Lee and DeKalb counties. Heavy rain will be biggest threat tonight through Monday morning. Very heavy rainfall will continue to push east over the next hour. Watch for ponding on the roads if you're out early Monday morning. Rainfall amounts over the past 24 hours. 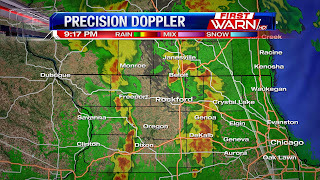 9:45pm Update: The tornado watch has been canceled for Carroll and Whiteside counties, along with Jo Daviess and Stephenson counties. 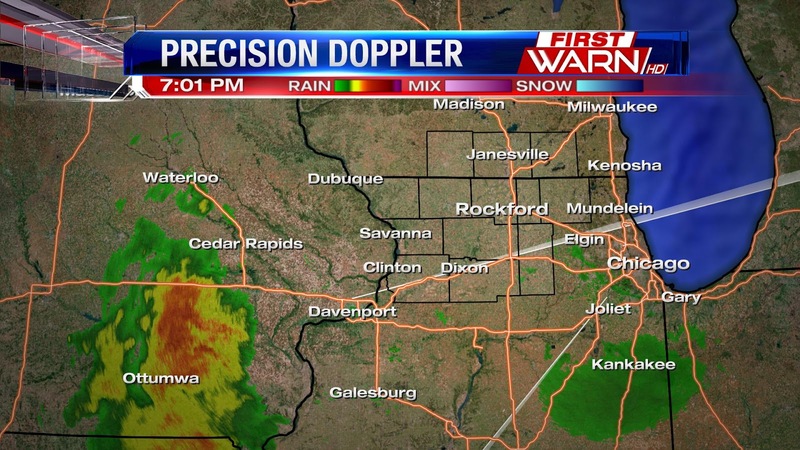 Additional showers moving through Northern Illinois will keep the watch going a little further east this evening. While the tornado threat this evening is low, it's not zero. 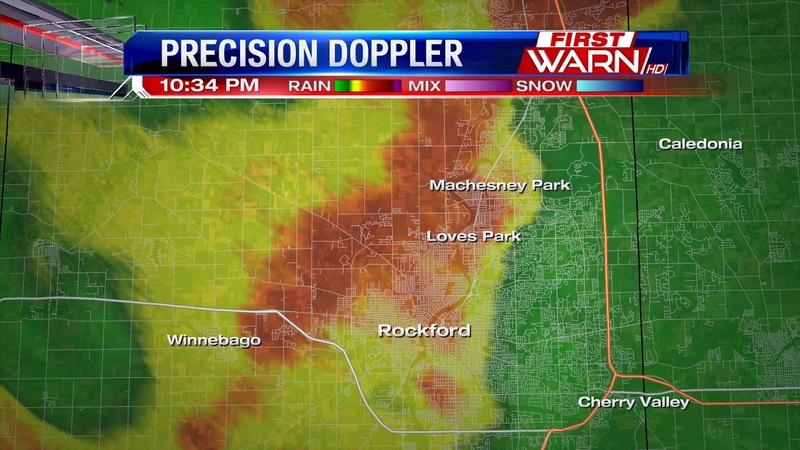 And storms that continue to enter into Northern Illinois could interact with the warm front that is currently just south of Rockford. Because of that, both the Chicago National Weather Service and Storm Prediction Center feel it is important to hold on to the tornado watch a little longer this evening. As you head to bed this evening, make sure you have a way to receive warnings should they be issued. I'll be here until the last county is dropped from the watch tonight! 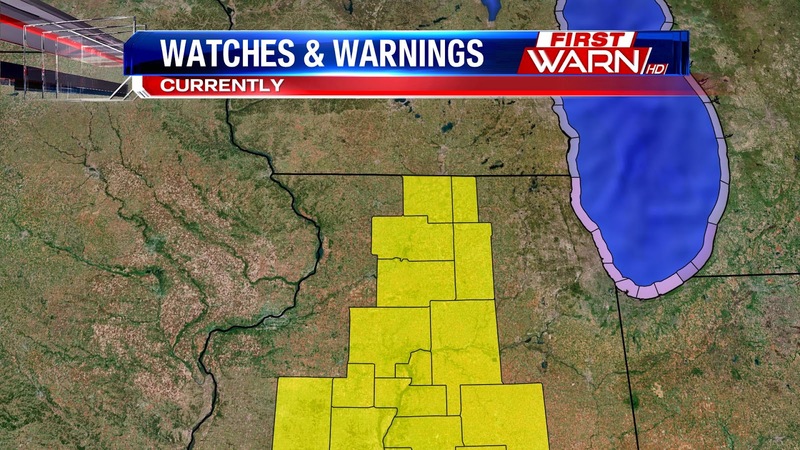 8:45pm Update: The Tornado Watch has been canceled for Jo Daviess and Stephenson counties in Northwest Illinois. 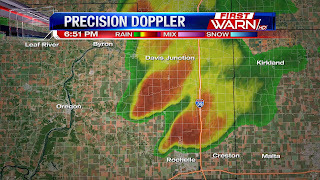 A brief tornado was reported earlier this evening in Eastern Iowa, but those storms are moving more north than east at the moment. 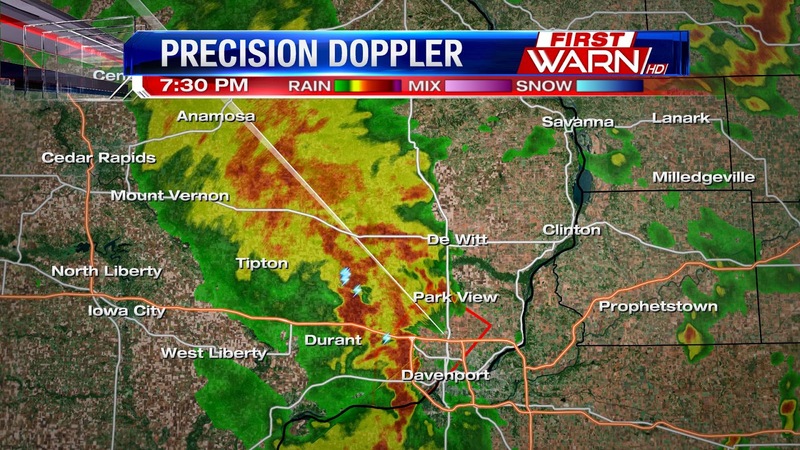 There was also a funnel cloud reported NW of Davenport, IA shortly before 7:30pm. 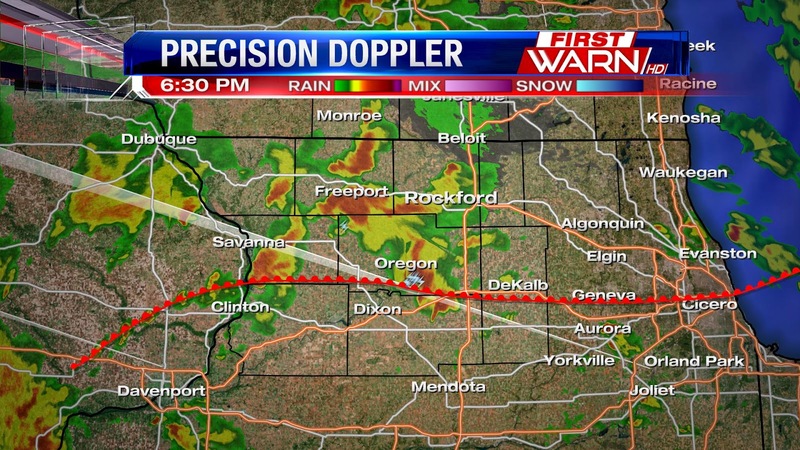 Closer to home, there are no active warnings as scattered thunderstorms will continue to develop through the evening. 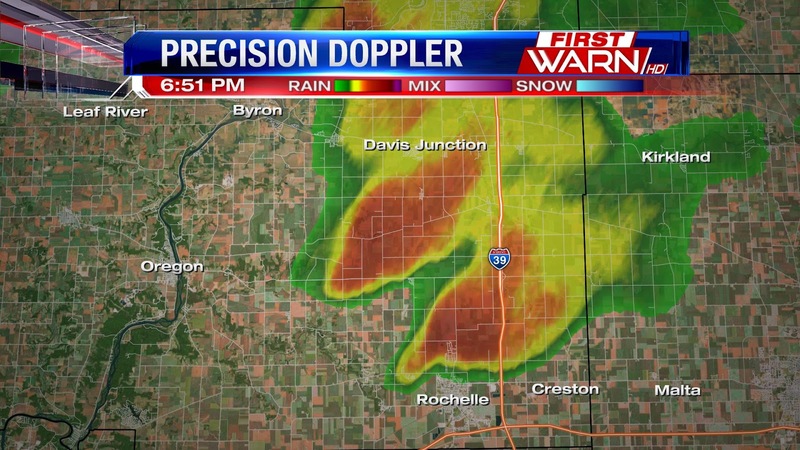 Storm now North of Rochelle (Ogle County) continues to show weak rotation aloft and remains near the warm front. Will continue to monitor very closely, but could be some stronger wind gusts associated with it. Technical discussion regarding severe potential this evening from the Storm Prediction Center. 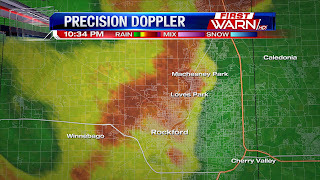 Isolated tornado threat continues along warm front now just south of Rockford. 6:40pm Update: Currently on the Tornado Watch remains in effect, but storms that move through will be very efficient rain produces with a cell moving through Stephenson County from Pearl City to Freeport to Ridott, and heading North. This will produce very heavy rain in a short amount of time. 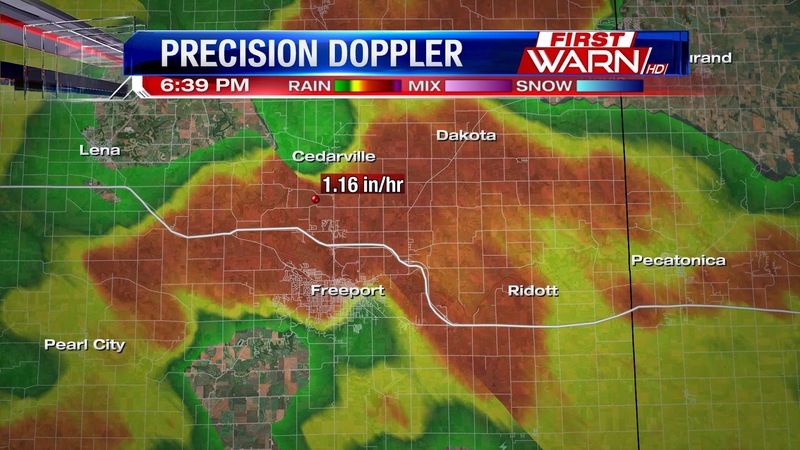 Ponding on the roads will be possible with radar estimated rainfall rates of over an inch per hour! 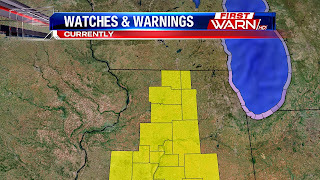 A Tornado Watch has been issued for Jo Daviess, Stephenson, Carroll, Whiteside, Winnebago, Boone, Ogle, Lee and DeKalb counties until 1am Monday morning. Thunderstorms are starting to increase in coverage this evening and will produce very heavy rainfall and gusty winds. Also, a warm front lies just north I-88 with a very warm and humid air mass behind. 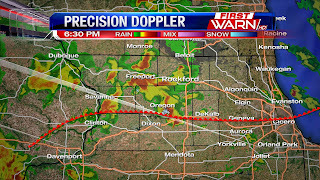 It is along this warm front that we have to watch storms very closely for any signs of broad rotation. 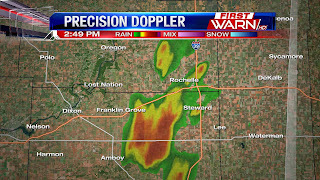 There have been a few storms just to the south of the immediate First Warn viewing area that did have some rotation within them, and there was a cell just to the east of Amboy, IL (Lee County) that had weak rotation as well. If the rotation holds on long enough as the cells interact with the warm front, there could be isolated tornadoes that form. As of right now, there are no active warnings out - just the Tornado Watch. Remain weather aware and continue to check back for the latest updates! The weather this week has been relatively quiet, and it will continue to be for at least the first half of your holiday weekend. Temperatures on Friday will warm back to 70° today with mostly sunny skies. 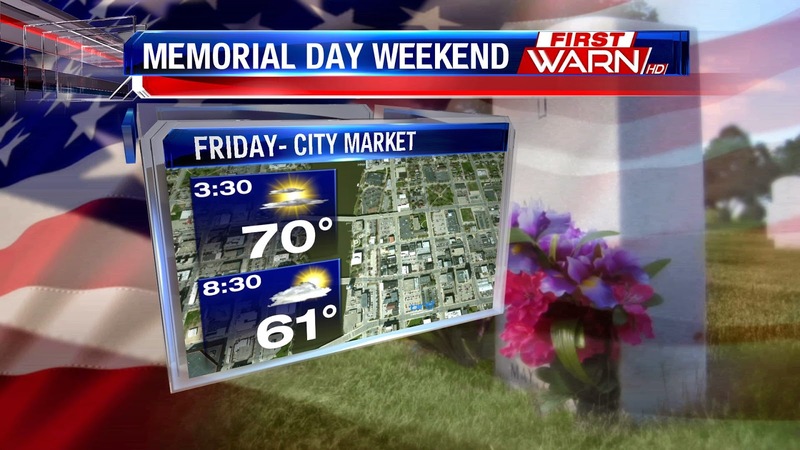 City Market kicks off today in downtown Rockford and it will be a perfect day for it! It opens at 3:30pm and temperatures should be in the lower 70's, and by the time it ends at 8:30pm temperatures will drop into the low 60's but it will still be very pleasant as the sun sets. case you are worried it will be a little too cool! The Young at Heart Festival is also this weekend at the Loves Park City Hall Festival Grounds. You'll be able to get the rides in on Saturday, but you'll want to keep an eye on the radar because we will have the chance for a few scattered showers and possibly a thunderstorm on Sunday and into Monday. 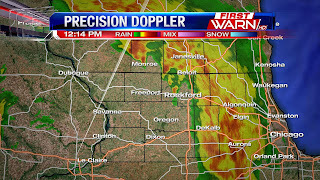 Monday afternoon the rain threat will be mainly over with the dry slot of the system moving in. This will bring in drier air and helping to cut off the rain. And while there is rain in the forecast, it won't be a total wash out, there will still be plenty of dry hours in the forecast too! The past two weeks have featured over a foot of rain and multiple reports of severe weather across the central and southern Plains - specifically for Oklahoma and Texas. That jet stream pattern will soon shift a little further east towards the upper Midwest and Great Lakes late this weekend and into next week. Winds above will shift around to the southwest, bringing warmth, but also bringing increased moisture from the Gulf of Mexico. 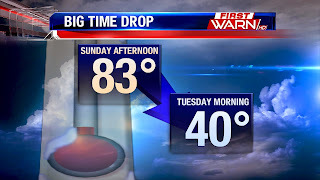 A cold front will settle close to the area Sunday night, but it won't pass through. This means temperatures will remain warm, but there will also be rounds of thunderstorms beginning as early as Saturday night and lasting pretty much through Wednesday. There will be many dry hours, but heavy rainfall becomes a big possibility with any storms that could develop. At this moment, the severe weather threat looks low, but be sure to keep your eyes to the sky this weekend if you've got any outdoor plans. The front end of the weekend looks pretty good, it's just the latter part we have to keep an eye on. 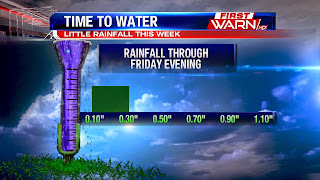 Friday looks like a repeat of what we experienced Thursday afternoon. A cool front will settle south during the morning Friday, but should come through dry. Temperatures will rise again near 70 degrees. Most of the active weather should remain to the west on Saturday, although cloud cover will gradually be on the increase. We may actually have a few clouds to start to the day on Saturday as a few very subtle disturbances move within the jet stream late Friday night. Sunday doesn't look like a total wash out, but the chance for rain does increase going through the afternoon and evening. Low pressure will spin closer to us late Sunday and Memorial Day itself. It might be just a little hard to get some of those parades in on Monday. A cold front will move closer, but doesn't completely pass for next week. This will keep our temperatures up, as well as the chance for thunderstorms heading into next week. After a record breaking cold day yesterday, with highs staying in the 40's, it's going to feel much better today and into the weekend. At 8:00am this morning it was already 47° in Rockford, which was the high temperature here yesterday. By this afternoon temperatures will have warmed into the upper 60's and low 70's under mainly clear skies. A weak trough or dip in the jet stream up above generated the cloud cover we saw this morning, but now that is moving out to the east and out of the area. 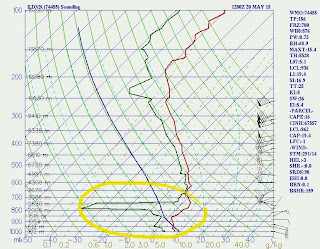 Behind that subsidence, or sinking air, is taking place and that this what is allowing skies to become more and more clear this afternoon. With plenty of sun today temperatures will be a good 15-20 degrees warmer than yesterday afternoon! A weak cool front will move through in the evening and that could provide enough lift to produce a few light and widely scattered showers in the early evening. If we see any showers fire up they won't stick around too long, winds will shift around to the north east later tonight and that could allow for a few more clouds to build in tomorrow afternoon. But, it will still be very pleasant with highs in the low 70's. 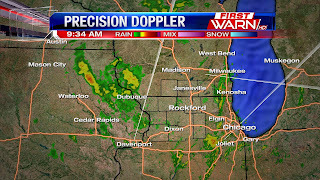 Many folks around north-central Illinois reported sleet, or ice pellets, with some of the heavier showers shortly after 11am Wednesday morning. It wasn't freezing rain, because in order to get freezing rain you need temperatures at the surface to be either at, or slightly below or above 32 degrees. Our surface temperature was in the middle to upper 40's. So, what happened in the atmosphere to cause this 'winter type' precipitation? Have you ever heard the term 'Evaporative Cooling'? How about this, when you get out of the shower or swimming pool, do you notice how when you first step out of the water you feel a little chilly? That's because the water is evaporating off of your skin. Evaporation is a cooling process and causes that chill you feel when the air is relatively dry and you get out the water. The same process can kind of be applied to our atmosphere. When looking at the amount of moisture we had in our atmosphere, or looking at our dew point numbers, we noticed that they were very dry. Just take for example the image on the left. 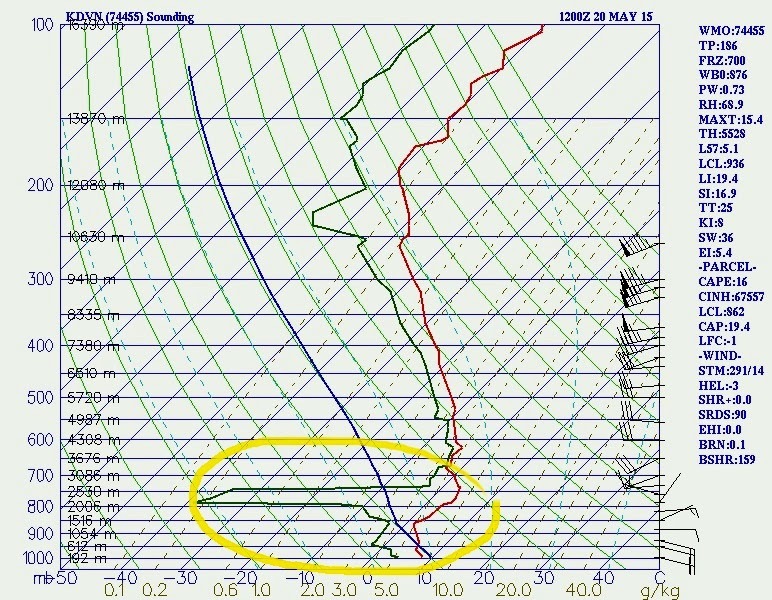 This is what we call an atmospheric sounding from Davenport's National Weather Service upper air balloon launch at 7am. The green line represents the dew point, and the red line represents the temperature. Do you see how at roughly about 800mb the green line quickly shifts to the left? Well, all throughout the atmosphere the air is dry. And the further away the temperature and dew point lines are to each other, the drier the air. So, let's apply this to what happened today. 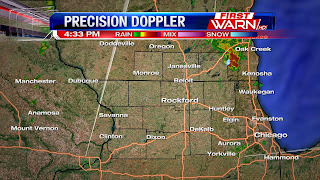 When the rain started to move into Northern Illinois, some of it may have initially evaporated due to the drier air. Over time, the temperature above started to cool, causing it to fall closer to 32 degrees. That's evaporative cooling. As the air above cooled, it caused freezing levels to drop low enough to allow for those ice pellets to mix in with the heavier rain showers. Pretty cool, right? Well, maybe not so cool with the weather today, but it's neat to see how our atmosphere works! It's hard to believe that we are talking about record cold temperatures on the 20th of May, but that's exactly what happened this afternoon. The cloudy skies and rain showers didn't allow temperatures to warm up much this afternoon and kept us in the middle and upper 40's. 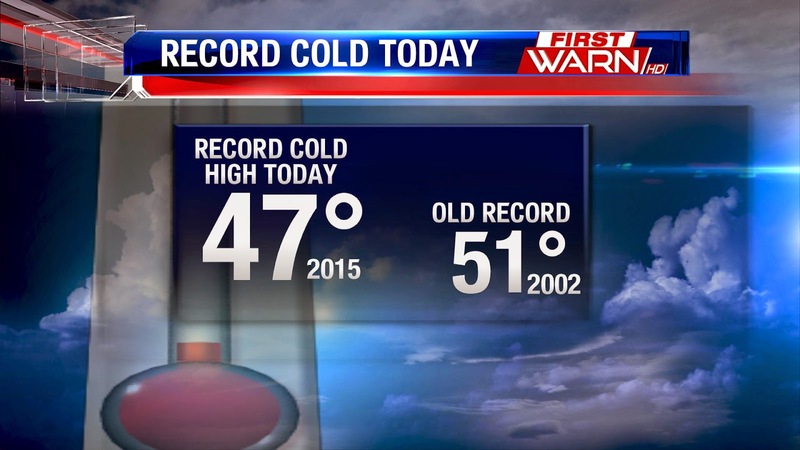 Officially in Rockford, the high only reached 47 degrees, nearly 30 degrees below our average high. 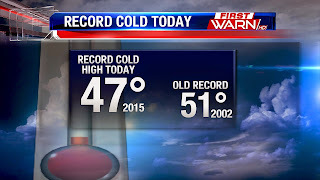 That 47 degrees broke the record for the coldest high temperature on this date. Previously, the record was 51 degrees set back in 2002. Not only did we break the coldest high temperature record, but it was also the coldest temperature any time during the month of May since May 3rd, 2011! Thankfully temperatures tomorrow will rise nearly 20 degrees above what our high was this afternoon. We should be back into the middle 60's for Thursday. But for tonight, you may need to throw the extra blanket on the bed. not only "violent" ( an F4 ) but also, tragically, deadly! No one died in Codell, but 5 people were killed in a home before the storm entered town. 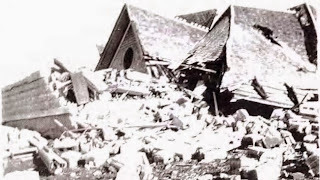 The tornado would kill a total of 9 people along the 60 mile track. It won't be much, but a few light showers will move through Wednesday afternoon. 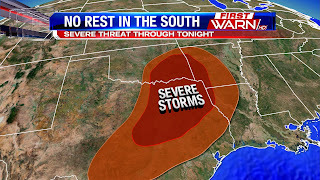 This is all in part with the system out west in the Plains that has been bringing severe weather, once again, across southern Oklahoma and north Texas. There is not a threat for severe weather this week, but cloudy skies Wednesday afternoon will hold highs in the middle and upper 50's. Look for the light showers to begin late morning and last through mid-afternoon. Amounts won't be much, as most of the steadier rain will fall to the south. Totals will range from just a few hundredths of an inch, up to a couple tenths. After Wednesday, the next chance for rain will arrive late in Memorial Day Weekend. We've seen a big temperature drop the past couple of days; with low 80s over the weekend, to 70° yesterday, to today where temperatures will only warm into the upper 50's. Overall, the work week is pretty quiet, besides a small chance for lighter showers tomorrow. But there are big extremes across the United States from north to south. 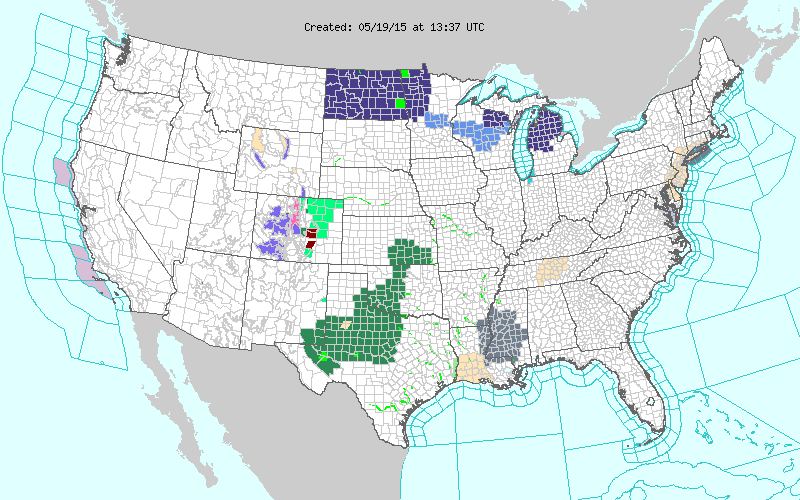 In the north through portions of the Northern Plains they are dealing with Frost and Freeze Warnings as stronger low pressure system pulls in colder air. Directly south in the Southern Plains it's not cold but extremely wet. 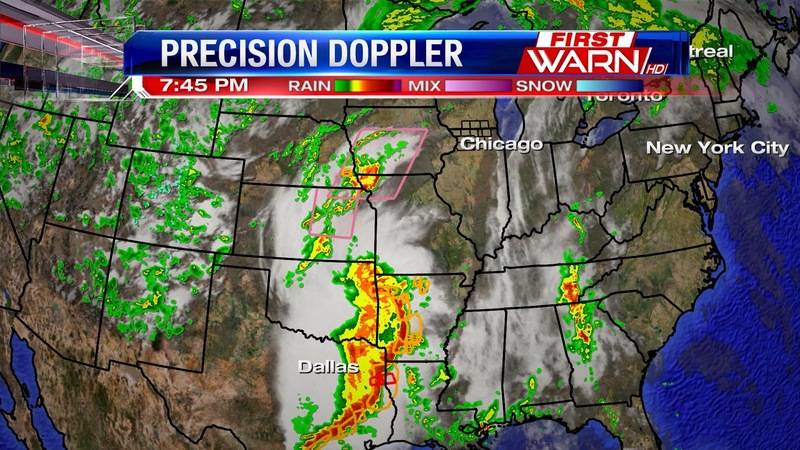 Heavy rain is continuing to fall through portions of Texas and Oklahoma along another low pressure system. Flood Watches have been issued across the area, with flash flooding also a concern. 21.04" of rain has fallen in Dallas, Texas so far this year, which is about how much they see in a year, and some rainfall rates were observed at 2" an hour at times. San Angelo, Texas received 4.64" of rain in 90 minutes last night! The quiet pattern for our area will slowly change going into the weekend, with showers and storms in the forecast for Memorial Day weekend. 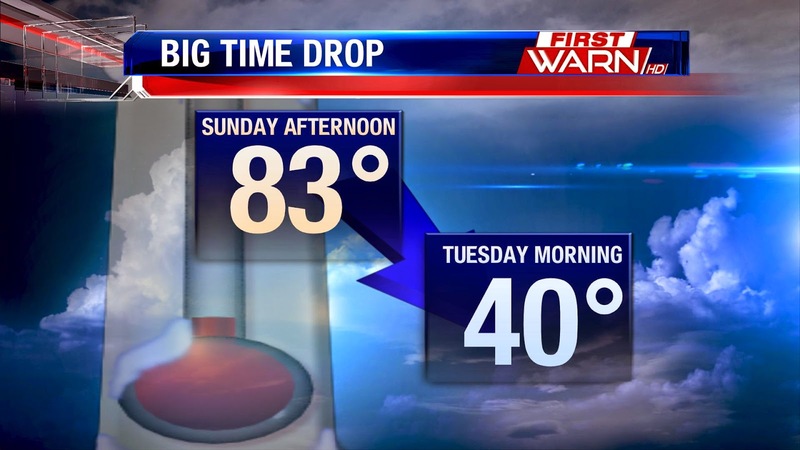 Low 80's on Sunday to the low 40's by Tuesday morning, get ready for a few chills coming in the next couple of days. Cloud cover will gradually be on the increase this evening as low pressure spins through the upper Great Lakes. Underneath those clouds in Wisconsin, temperatures didn't make it out of the 40's! Yikes! This after they had severe weather Sunday afternoon. Freeze Warnings and Frost Advisories have been issued for the far Northern Plains with temperatures falling into the upper 20's tonight! Thankfully, those chills won't make it this far south, but highs in the upper 50's are chilly enough. After a couple pretty muggy days, dew points and temperatures will be dropping as early as Monday afternoon. While it might not be so much temperatures on Monday, the dew point will drop making it feel more comfortable. Remember, dew point is a measure of moisture in the atmosphere. The higher the dew point, the more moisture. And the more moisture means the more humid it feels. Dew points over the weekend were in the upper 60's to near 70 degrees. That type of air mass is very tropical, and when numbers start to get that high it just feels very comfortable. Monday morning, dew points will start in the 50's, but then drop into the low to mid 40's by the evening. This is with a much cooler air mass that is bringing snow, yes snow, to the Northern Plains in North Dakota! We won't see temperatures that cold, but highs on Tuesday and Wednesday may be stuck in the 50's. 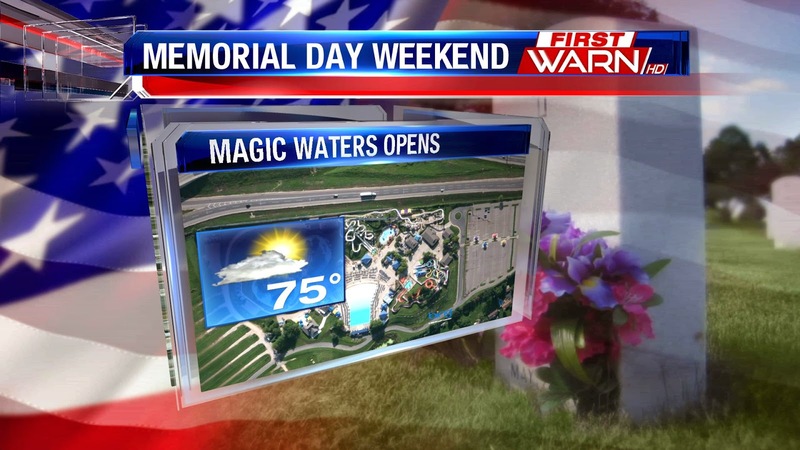 After that, temperatures will moderate back into the 70's towards this next upcoming weekend. 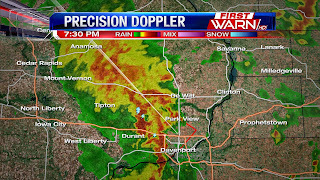 With our severe threat ending, I'm going to take down the LIVE radar. Should thunderstorms fire back up, I'll bring back the radar. 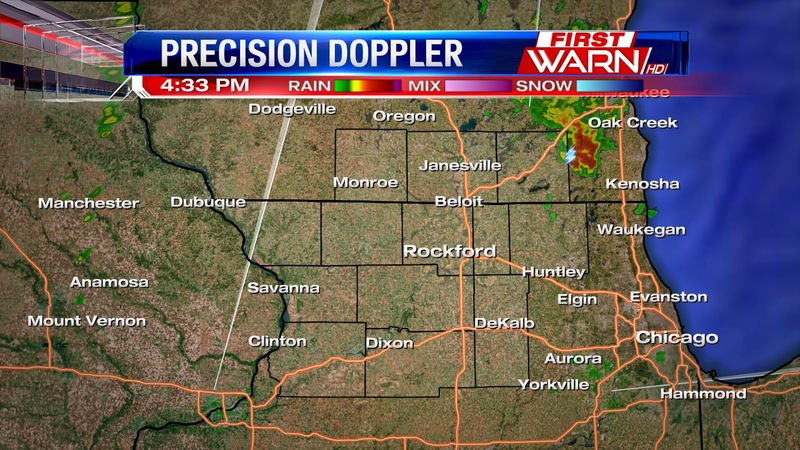 4:30pm Update: The thunderstorm that moved through southeastern Boone County and into McHenry County is now in Wisconsin with skies turning blue once again across Northern Illinois. Thinking that over the next couple of hours our storm chance will greatly diminish heading into the overnight. 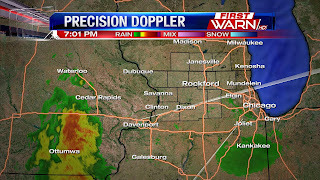 I'll still hold on to an isolated storm chance just with what's developing back west in Iowa, but I think what came through earlier is all we're going to get. 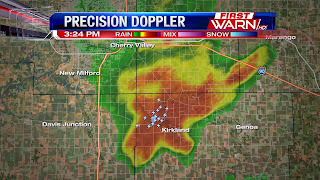 Was paying pretty close attention to the cell that quickly developed north of Kirkland and Kingston. It did show signs of broad rotation for a little while, but has weakened slightly. Garden Prairie now getting some pretty heavy rain. Heads up Marengo. 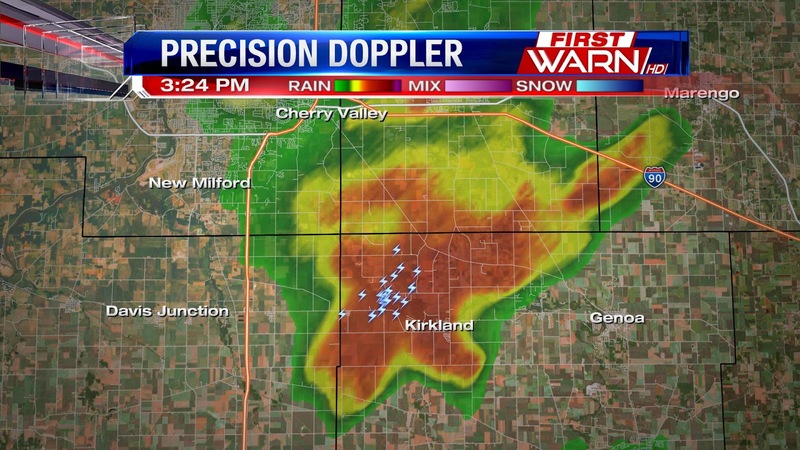 Thunderstorm developing in and Kirkland, moving in south of Belvidere. 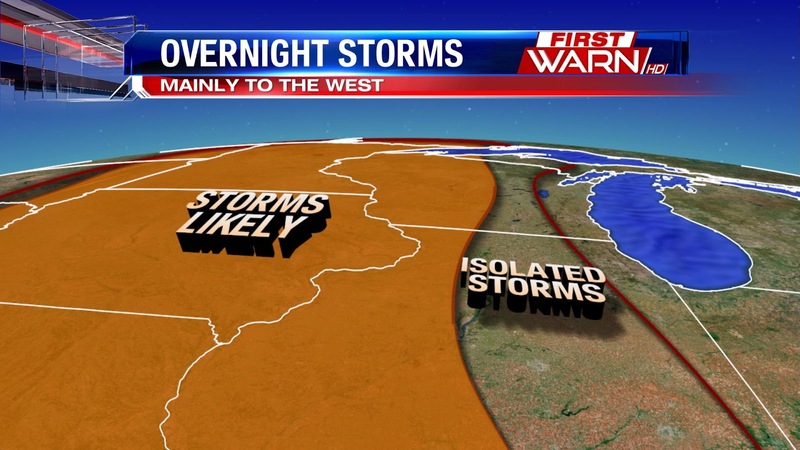 Frequent lightning and heavy downpours likely. 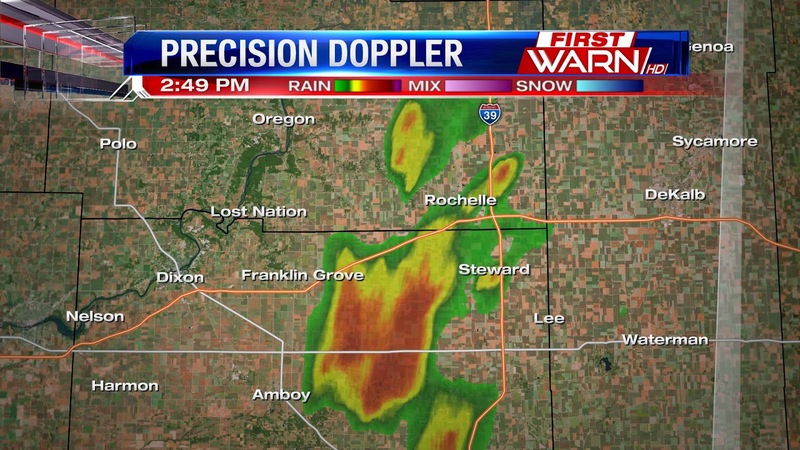 Radar update: Look for heavier rainfall south of Rochelle and west/southwest of Steward. Still no lightning strikes with these, but with dew points in the middle and upper 60's, heavy downpours are likely. 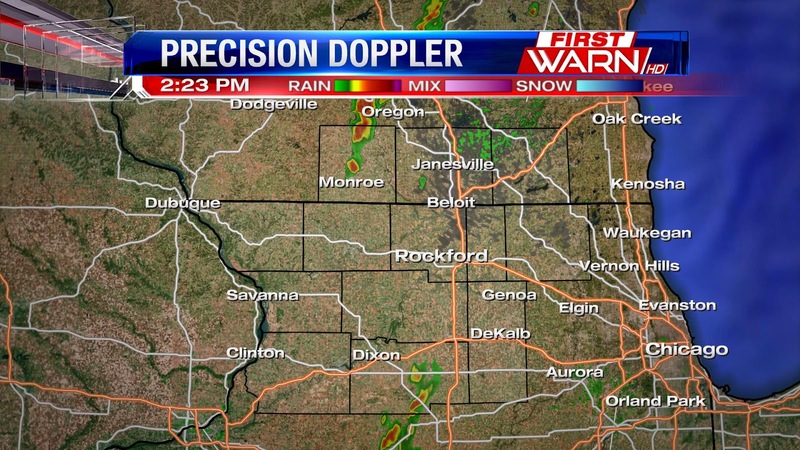 2:30pm Update: Current check of radar shows not much has developed in N. IL and S. WI. There have been a few heavier showers near Monroe in Wisconsin and south near Mendota that are now lifting into central Lee County. 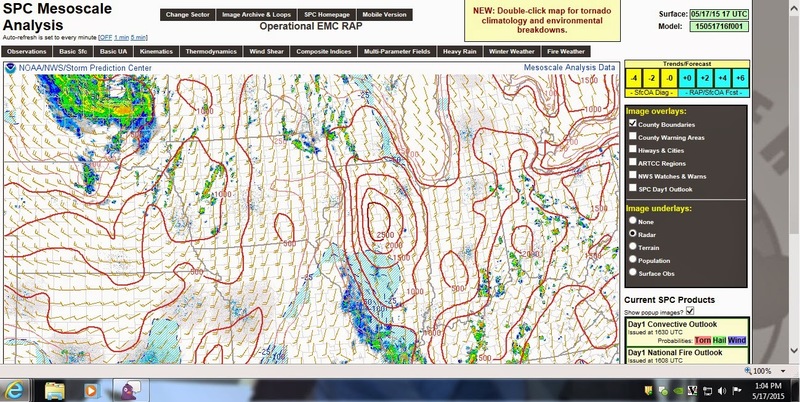 While the instability is building, there isn't much 'lift' in the atmosphere to help generate thunderstorms. This is mainly due to warmer air aloft. It's not allowing the air to rise which is limiting storm growth. There is, however, an isolated severe risk developing across Southern and Central Wisconsin. Although, a watch is not anticipated at this time. For a look at that, click on the latest discussion from the Storm Prediction Center. A Slight Risk for severe thunderstorms remains in place across Northern Illinois and Southern Wisconsin as strong low pressure pulls through the upper Midwest. Now, many of you have asked if this is a set-up similar to what happened back in April, and no, not completely. While there is a low end risk for tornadoes this afternoon, the greatest threat for those will be closer to where the warm front, low pressure and cold meet in southern Minnesota, Wisconsin and northern Iowa. Our greatest storm threat will likely be strong winds. Skies have been clearing out since mid-morning today, and this has actually allowed instability to greatly increase across N. IL. The image to the left is what we call CAPE, or Convective Available Potential Energy. This indicates the amount of energy in the atmosphere thunderstorms would have available when they develop. Numbers usually over 1,000 J/KG (Joules per Kilogram) are needed to build stronger storms. 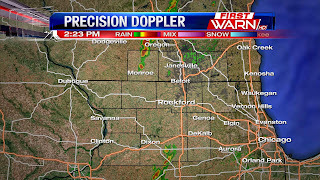 Scattered thunderstorms are beginning to develop in western Iowa and southern Minnesota, and this activity will continue to develop throughout the afternoon. Storm development for Northern Illinois and Southern Wisconsin could be as early as 2pm, but may hold off until after 3pm, as what's developing a little further north into Wisconsin may continue to develop further south into Northern Illinois. As always, updates throughout the afternoon will continue so be sure to check back! Though Friday is starting off on the cloudy side, we will see more sunshine to end the day. 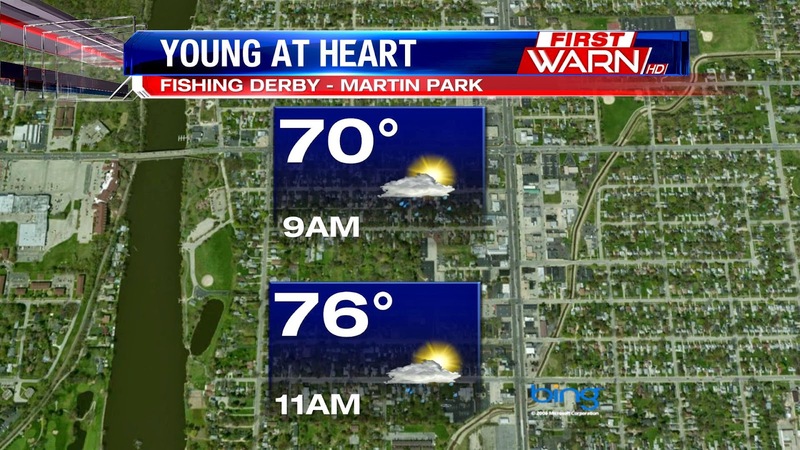 Temperatures will warm to 75° with winds from the south at 10mph. Overall it'll end up being a nice afternoon, but it will feel a little humid. Friday afternoon will stay dry but as a cold front skims the Stateline area and becomes stationary near southern Wisconsin, it will bring a chance for isolated showers overnight and early Saturday. 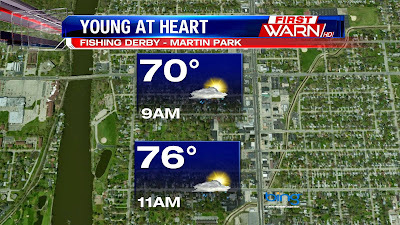 If you are heading out to the Fishing Derby this Saturday in Loves Park for the Young at Heart festival (the actual festival is next weekend) or maybe to the Swedish American Safety Fair, overall it will be a nice afternoon. There are a few rain chances but it looks to be a little later in the afternoon...around 2pm or 3pm. So you should be able to get your events in before rain chances increase, but you'll want to grab an umbrella just in case you're caught under a heavier downpour. It will also be a little muggy for the weekend with warm and moist air surging in from the gulf. 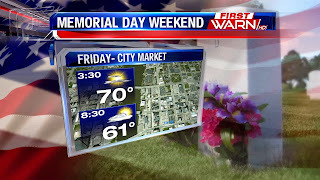 Temperatures will warm into the low 80s for Saturday and Sunday. There is still a threat of storms looking towards Sunday afternoon, so we will continue to keep you updated as the system evolves. Whether or not you believe global warming is actually occurring, the truth is over the past several years, our planet has been warming. 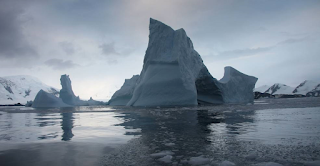 Now, a new NASA study shows that Antarctica's Larsen B ice shelf is almost gone. Located on the coast of the Antarctic Peninsula, the Larsen B remnant is about 625 square miles (1,600 square kilometers) in area -- roughly the size of Lake Superior and Lake Michigan combined -- and about 1,640 feet (500 meters) thick at its thickest point. Its three major tributary glaciers are fed by their own tributaries farther inland. What's an MCV (Mesoscale Convective Vortex)?